Nikki will have to try to stay away from alcohol after Neil's death in the next episodes of 'Y&R'. ''Young and the Restless" ("Y&R")' spoilers from TV Line reveal that the death of Neil Winters will upset Genoa City. Moses and Leslie will also be present at his funeral, which could give rise to new scenarios. Nikki will be particularly troubled by Neil's death and her first thought will be to fight her pain with alcohol. However, during the funeral ceremony, she will promise her friend not to give in to the bottle. Paul will try to stay close to her, but Nikki will be very vulnerable. 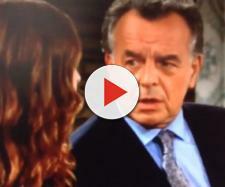 ''Y&R' spoilers tell us that Nikki could fall back into alcoholism again and lose control of his life. ''Y&R'' spoilers say that the soap will see a new tragedy. Nikki has had alcoholism problems but could fall back into vice, notes Soapoperaspy. The tragic death of Neil, his best friend, will endanger his sobriety. Nikki has already had to face the loss of Katherine and now she will have to accept that another person dear to her will no longer be there. The death of Neil Winters will upset all of Genoa City. No one is ready for this unjust and unexpected loss. Paul will try to stay close to Nikki who, in the meantime, will suffer from severe depression. In this dramatic circumstance, she will seriously think that the only solution to quench her suffering is to take refuge in alcohol. Will Paul be able to save Nikki from herself and keep her away from the bottle? How will Neil die in ''Y&R''? The soap opera spoilers tell us that Winter will be involved in a terrible road accident and will die on the spot. Nikki will be the first to learn the news and will be shocked, as well as all Genoa City. On the day of Neil's funeral, everyone will mourn him. Nikki, during the ceremony, will think about the good times spent with him and his soul so kind and pure. Thanks to the memories of her friend, she will promise not to fall back into the vice of alcohol. Nikki is aware that if he starts drinking alcohol again, Neil would not be happy. However, her inner demons will not leave her alone and it will not be easy for her to keep her promise. ''Young and the Restless'' spoilers suggest that Nikki could enter the tunnel of alcoholism again if someone doesn't try to stop her. The Newmans will try to console Nikki and join her in her pain, worried that she may lose control. Other Young and the Restless spoilers say Davon will open a new restaurant while Lily gets out of prison. In addition, Moses may return to the city to pay homage to his father. Leslie Michaelson will also be present at Neil's funeral, so is a new storyline coming? We just have to follow the next ''Young and the Restless'' (Y&R) spoilers.